Stay in our boutique hotel next door to the Vibrant Santa Fe Railyard District and Steps away to the Historic Plaza. 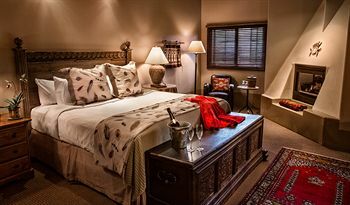 The Hacienda Fireplace room reflects the elegance and luxury of a beautiful hotel. Our decorative style captures the spirit of Native American. The fireplace room includes a king size bed, CD player, wireless internet, humidifier, mini bar, in room safe, coffee maker, hair dryer, plush terry robes and slippers. Guests can take pleasure in the spacious tile and granite bathroom while enjoying double headed walk in showers and upgraded bath amenities. Butler service is provided to ensure your stay is complete. ©2015 Hotel Santa Fe . All rights reserved.